It’s no secret that obesity has been on the rise in the United States over the last three decades, and children haven’t been immune. In fact, according to the Centers for Disease Control (CDC), “The percentage of children aged 6–11 years in the United States who were obese increased from 7 percent in 1980 to nearly 18 percent in 2012.” As a parent of a toddler, you’ve probably been so busy trying keeping up with your active little one that the possibility of your toddler being overweight or obese is likely one of the last things on your mind. It's important that parents don't ignore their toddler's weight. Being obese places a child at higher risk for several serious health conditions, including some that can start during childhood and teen years, including diabetes, heart disease, asthma, certain cancers. Also, according to Staiano, many children with obesity face bullying from peers, which can be harmful to the child’s self-esteem. While a toddler may not be at risk for any of these immediate consequences, it is important to note that it becomes increasingly difficult to get a child from the obese category to the healthy weight category as a child gets older because eating and activity habits are being ingrained and the weight difference becomes larger, says Staiano. "A 2-year-old child may only need to stay the same weight for a few months for the height to “catch up,” whereas a 10-year-old may need to lose several pounds." But how do you even know if your toddler is overweight or obese? Similar to cognitive, gross motor, and fine motor skills milestones, the range of what is "normal" when it comes to a toddler’s weight varies widely and a few pounds can make a big difference depending on height. Plus, it’s not uncommon to see a stocky child become long and lean the minute he or she learns to walk. According to Staiano, parents can educate themselves by going online and finding out their child’s weight category. For ages 2 and older, the CDC offers a calculator that allows parents to enter their child’s information and learn if their toddler is classified as underweight, normal weight, overweight, or obese. Note: This calculator only works for children ages 2 and over because that’s when health professionals start using the body mass index (BMI) growth charts. So what should you do if your toddler is classified as overweight or obese? According to Staiano, there’s no need to panic. “[Learning your child is classified as obese or overweight] just means you’re equipped with knowledge about your child’s health," explains Staiano. And once you’re equipped with knowledge, you can take action." As a parent who is concerned about their child's weight, the first thing you should do is make an appointment your child's pediatrician. Together, you can come up with a plan. "The pediatrician should be plotting the child’s height and weight on a growth chart and talking with the parents about ways to help their child eat healthy and get physical activity," says Staiano. "At the young age of 1- or 2-years-old, the goal is not for the child to lose weight, but rather to either slow down weight gain or to keep the weight the same. This allows the child’s height to 'catch up' to the child’s weight. It also helps if parents prepare in advance to have the conversation with their toddler's doctor. "At LSU’s Pennington Biomedical Research Center, we designed a toolkit especially for Louisiana pediatricians, but this toolkit is also available for free for parents anywhere. It gives an idea of what doctors should be doing to screen for obesity and counsel families on weight management. Parents can download the toolkit and are welcome to print it out and take some pages to their doctor to help the conversation," says Staiano. Encourage your child to try nutrition foods. Everyone knows toddlers have a reputation for being picky, but keep pushing the fruits, veggies, whole grains, and lean proteins. Research shows it can take up several exposures to a new food before convincing a young child to try it, much less like it. Try different preparations of veggies that change the way the food feels in the mouth (think crunchy versus mashed versus roasted versus pureed). Something as simple as preparation can help increase the chances your "picky" child will eventually come around. When in doubt, sneak the veggies into foods you know your toddler will eat. Add finely chopped veggies to mac and cheese or blend a green smoothie with bananas, strawberries, and spinach. The fruit should make it sweet enough to taste like a treat. Make sure your child sees his or her parents eating nutritious foods. In fact, start healthy family mealtime habits now—the sooner the better. Cook nutritious foods. Turn off cell phones, the television, and other devices, and sit down together for family dinners. Keep the screen time to a minimum. Not only does an increase in screen time typically mean a decrease in active time, screen time can also mean your child is seeing commercials for sugary snacks and cereals that feature colorful (and potentially enticing) cartoon characters and catchy jingles. "Toddlers and preschoolers don’t understand that commercials are meant to be persuasive," says Staiano. "If your child is going to watch TV, mute the commercials and do a fun interactive game during the break!" Or, use a service like Netflix or Hulu and skip the commercials altogether. Make sure your child is getting plenty of exercise most, if not all, days of the week—and outside when possible. Of course, there is no need for a "formal" exercise routine with a toddler or preschooler. Take your child to local playgrounds, enroll him or her in a toddler class, like tumbling, soccer or dance, or simply let him or her run around in the yard. You can also make exercise a regular part of family time. Try a parent and child yoga class, bike to the farmers market, and simply engage them in physical activity whenever you can. Keep the fruit juice to a minimum. While fruit juice can be included once in awhile as part of a toddler's healthy diet, it's better to stick to water when possible. Fruit juice often has artificial sweeteners and added sugar, which equals empty calories that won't fill your little one up. Enforce a schedule that allows your toddler to get plenty of sleep. Naps and an early bedtime help keep a child well-rested, which means your toddler will be less likely to be cranky or have a tantrum at the suggestion of trying new foods or participating in activities (among plenty of other great reasons to keep your toddler on a schedule). Be an advocate for your child when he or she is not in your care. "Think about places your child spends time and ways to make them healthier," says Staiano. 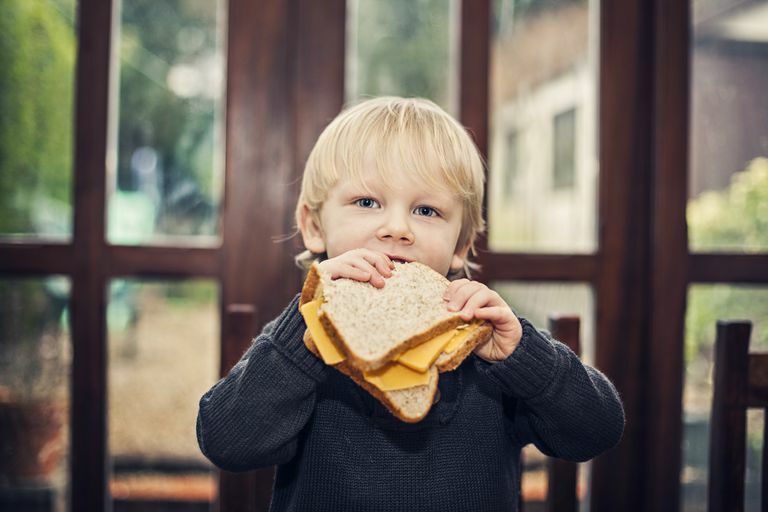 "If your child goes to a preschool or day care, find out what the child is being fed, what kind of physical activity the child does each day, and how much (if any) screen time is being allowed. Then find ways to help the center improve policies and practices to create a healthier environment for all of the children." Finally, as a parent of a toddler, remember that you can teach habits now that lower the risk of childhood obesity or obesity later in life. Moreover, it's important to remember that your young children are watching you and you need to practice what you preach. "Healthy living is for the entire family," says Staiano. "If one child is struggling with obesity, the entire family should eat healthier and move more together. It’s harmful to target one child when the siblings (or parents!) aren’t eating healthy or getting physical activity."